Listening to this three tracks side by side , it revealed before me the great picture of american folk music on record, the three generations that shaped its tradition. First, you have the “real folks”, people that were recorded in the twenties and thirties, but carried with them a long oral tradition that predates the recording industry. Then came Woody Guthrie and Leadbelly, the two greatest figures of the folk movement of the forties, that was more involved with social issues and politics, already on the marge of the recording industry and “popular music”. And finally, you have Bob Dylan and the “folk revival” of the fifties and sixties, that reflects the heritage of what came before him and represented the new conscience of young people in America and all over the world in search of an alternative to the mass-entertainement culture and an authentic tradition to hang on to. From Shiraz Socialist: The King’s Speech – a right royal falsification; Remembering Dorothy Thompson. Timothy Snyder: Hitler vs. Stalin: Who Was Worse? From BobFromBrockley: “Progressive London”: A Popular Front for reactionaries. Peter Berger: Revolutionaries with American passports. Joseph J. Cohen: “The Right to Self-Determination” (1951) This is a fascinating text from The World Scene From The Libertarian Point of View. For information on Cohen, see Notes in the margins. “The movement must fight back as one”. News Line (April 9, 1983); “May Day in Libya” News Line (May 1976). Bitter irony as the people of Libya rise up heroically against the dictator Gadafi. Joseph A. Labadie: “Is Tyranny a Necessity?” in Liberty X.21, Whole No. 307 (February 23, 1895). 7. Three great proletarian anthems for you this week. And tried to feed my mama’s hungry eyes. Following on from Mikey’s post here about socialist commandments, here are a couple with titles inspired by socialist hymns: Arise ye workers from your slumbers (about the SWP front, the Right to Work campaign – even the name should be anathema to real communists) and On tyrants only we’ll make war! (about the Stop the War left’s hypocrisy about tyrants). Talking of tyrants, David Osler has a very good piece on whether clerical fascists can turn social democrats (thinking of the Muslim Brotherhood), which cites an excellent piece on the Middle East from Tony Cliff in 1946, which I think I recently linked to. And talking of Cliff’s International Socialists, I didn’t know Lord Macdonald of Tradeston was an ex-member, until reading this piece by comrade Osler, whose title references one of my favourite Lenin paraphrase. Unrelated, here’s comrade Osler on Japanese Maoism. Monitoring last week’s news from Tahrir Square, it was impossible not to be reminded of an essay George Orwell published in an obscure monthly magazine called The Adelphi shortly before the start of the Second World War. The piece seldom gets reprinted these days, doubtless due to its somewhat bracing title: Not Counting Niggers. 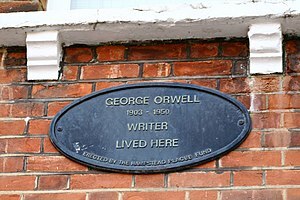 In it, Orwell makes the, by now unexceptionable, point that in a prosperous country left-wing politics is always partly humbug, because a thorough-going reconstruction of society would lead to a drop in living standards, which no politician of any party is ever prepared to countenance. He also points out – this was in 1939 when the Empire’s working-class population included several hundred million Indian labourers – that Britain’s standard of living was linked to the exploitation of people earning a few pence a day and dying before they were 40. Fast-forward 72 years and a very similar piece of moral sleight-of-hand applies to our relationship with the autocracies of the Middle East. A new blog to me: Work Resumed on the Tower, “a blog focused [on] popular culture, literature, and politics from a radical, anti-capitalist perspective.” I very much recommend a recent post: In Defense of (a slightly more modest) Marxism. Taming the Trots: Anarchism’s Sisyphean Task: Rachel at Northern Voices on a misery of sharing the left with the likes of Linda Taafe. The members of the WRP (‘Workers Press’) with whom I collaborated in Workers Aid were among the bravest, most principled and most committed fighters for social justice and political liberation that I have ever met. When the Bosnian genocide was at its height and when much of the rest of the Western left was either sitting on the sidelines or actively sympathising with the perpetrators, these people built the Workers Aid movement to bring aid to, and show solidarity with, the people of the Bosnian city of Tuzla. This was an industrial city with a proud left-wing and working-class history, whose own miners had supported the British miners’ strike in the 1980s and whose citizens maintained a social democratic administration in power throughout the Bosnian war. Members of the WRP/WP and other supporters of Workers Aid – sometimes risking their own lives as they guided their convoy of rickety lorries along the broken roads of a country at war and through sniper zones – built a movement of solidarity between British and European trade unionists and Bosnian trade unionists that defied the ethnic cleansers and their Western backers. That is the WRP with which I worked in the 1990s, and to whose newspaper I contributed. Although I have since mostly lost touch with them, I remember with particular respect and fondness Bob Myers, Dot Gibson, Charlie Pottins, Bronwen Handyside, Cliff Slaughter, the late Geoff Pilling and others, some of whose names I don’t recall. It was an honour to have worked with them and to have contributed to their newspaper, and though I suspect they might not approve of my subsequent political evolution, I would do so again. So no, I don’t find my past association with them ‘embarrassing’ (I have advertised my former involvement with Workers Aid in the ‘About’ section of my blog since the day it was launched); they represented what was best in the British left. For someone like Daniel Davies, whose sole political activity seems to consist of running a blog devoted to smearing and rubbishing other left-wingers, the same cannot be said. Thou shalt inscribe on your banner: ‘Workers of all lands unite. You have nothing to lose but your chains: you have a world to win’. Thou shalt not be a patriot for a patriot is an international blackleg. Your duty to yourself and your class demands that you be a citizen of the world. Thou shalt not usurp the right of any man or woman, nor shall you claim for yourself any natural advantage over your fellows; for every man and woman has an equal right to an equal share in the product of their collective labour. Thou shalt not take part in any bourgeois war, for all modern wars are the result of the clash of economic interests, and your duty as an internationalist is to wage class war against all such wars. Thou shalt teach Revolution, for revolution means the abolition of the present Political State, and the end of Capitalism, and the raising in their place an Industrial Republic. Thou shalt demand on behalf of your class, the complete surrender of the capitalist class and all the means of production, distribution and exchange, with the land and all that it contains, and by so doing you shall abolish class rule. Thou shalt wage the class war, by pointing out that the history of all recorded societies is an history of the Class Struggle, and that the emancipation of the working class from wage-slavery must be brought about by themselves. Thou shalt take part at all times in the political and economic struggles of the working class. Thou shalt renounce craft unionism, and work for the organisation of the working class into one vast industrial union, to take and hold the means of life. Thou shalt perform a mission in society by achieving an ideal of a fuller and higher life for all, in the abolition of classes, and by the regulation of industry by the Industrial Republic, which shall end the Political State. Thou shalt remember that the economic structure of Society determines the legal and political super-structure, and the Social, Ethical, Religious, and intellectual lifeprocess in general. It is not men’s consciousness which determines their life; on the contrary it is the social life which determines their consciousness. Raphael Samuel, “British Marxist Historians, 1880-1980: Part One,” New Left Review I/120, March-April 1980, pp.47-48. Let the scent of jasmine spread! From Mehmet Ali to Mubarak: a history of Egyptian nationalism. Time to ditch the paper: the Leftover Left and the newspaper. Trotsky’s killer in Santa Fe Haagen-Dazs. Andrew Coates reviews Paul Berman’s Flight of the Intellectuals. Norman Geras on being a Marxist. The social revolution of the 21st century cannot take its poetry from the past but only from the future. It cannot begin with itself before it has stripped away all superstition about the past. The former revolutions required recollections of past world history in order to smother their own content. The revolution of the nineteenth century must let the dead bury their dead in order to arrive at its own content. There the phrase went beyond the content – here the content goes beyond the phrase. Egypt was the home of the first recorded labour strike in history, a wildcat stoppage of craftsmen in the tombs of the pharoahs. Like the current unrest, it was partly a struggle over hunger. A contemporary document recounting the first ever recorded labour strike, which occured in Deir el Medina, Ancient Egypt during the reign of Ramses III when workers did not receive their rations. The stoppage occurred in the 12th century BC, on the 21st day of the second month in the 29th year of the reign of the pharaoh Ramses III, while Ramses was fighting a series of wars and engaging in an extensive building campaign. The strikers were hereditary craftsmen who worked on the tombs of the pharaohs, the vast complexes that to this day draw visitors from all over the world to the Valley of the Kings. This papyrus was written by the scribe Amennakhte at Deir el Medina. It describes the workers’ struggle, and the corruption which had spread throughout the administration. On this day the crew passed the five guard-posts of the tomb saying: “We are hungry, for 18 days have already elapsed in this month;” and they sat down at the rear of the temple of Menkheperre. The appalling pauperization of the masses of workers and peasants in Egypt and the exacerbation of class tensions are manifested very clearly in the spontaneous eruptions of the masses. The bitterness pent up in them erupts fruitlessly, as all these eruptions and insurrections are unplanned and are not guided by a proletarian leadership able to convert the destructive force of rebellion into the creative power of socialist construction. The recurrent eruptions of the agricultural masses are evidence of the point that Egypt’s social tension have reached, as well as of how far the objective conditions for liberation of the masses have ripened, and of the absence so far of a force that would undertake the realization of this endeavour. 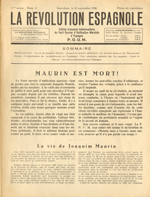 The outbursts of rebellion that pent up within the masses are of various degrees and kinds: from setting fire to the feudal landlord’s granary, murdering the “umara” (the local village sheikhs who are agents of the banks, the trading companies, the estate owners and the government), murdering policemen and soldiers, to attempts at an agrarian reform. For the time being, the class struggle of the masses is in its lower stages. The number of granary arson cases in 1928–29 was 5,760, in 1929–30 – 6,700, and in 1931 – 7,820. The incidence of “umara” murders in 1931 was 744, in 1932 – 711, and in 1933 – 752. Clearly, the struggle will be long and much blood will be spilt until the toiling masses recognize the way by which alone will come the full abolition of the conditions that oppress them. The centrality of bread and hunger to Egypt’s history of militancy continued through the 20th century. 1977 saw the “bread intifada”, uprisings against Sadat’s government. The prequel to that moment was told in 1976 by Phil Marfleet in the SWP’s International Socialism and again in IS (by Phil again?) in March 1977. The article is written in the vein of the IS’s Third Campism, its utter rejection of Stalinism and authoritarian Third Worldism – rather sad, given their courting of those things in more recent years. Egypt has also been a centre of the libertarian socialist movement for as long as many parts of Europe, with Errico Malatesta being based in Alexandria for some time, and a thriving Greek and Italian anarchist workers movement, as described in this article. A very little known chapter in the history of struggle in North Africa is the number of veterans of the Spanish Civil War who found their way to the Maghreb, including to Tunis. This article by Nick Heath is a thumbnail sketch of one such, anarchist Giuseppe Pasotti who died in Tunis in 1951. What is the Moslem Brotherhood? It is the most backward organization in Egypt. It is supposed to group together about 300,000 disillusioned, very fanatical petty-bourgeois. It has no program except to overthrow the Constitution and replace it with the Koran. It has no political experience so that, for the time being, it can be maneuvered by the Court’s agents. The American and the Russian propagandists in the Middle East have shown great interest in the Moslem Brotherhood and seem to consider it as a possible winning horse. The Russians have made a fuss of their Islamic policy in their Moslem Republics. But there are no indications for the moment that the youth and the proletariat are ready to follow the MB, which is definitely too backward even for the British. Apparently the MB will be used as a sort of pending menace and instrument of blackmail in the hands of the Court’s politicians. Whether it will free itself from such hands or not is a question that cannot be answered now. The forces of the left are in the making. Since 1940 the Socialist idea has been successfully infused into the proletariat. 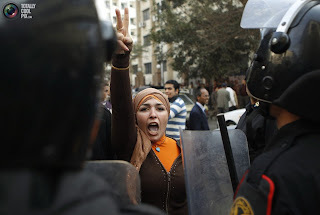 One advantage of the situation is that there is no such thing as a social-democratic party in Egypt. Trotskyism and Stalinism face each other without intermediate parties. Numerically the Stalinists are stronger, but extraordinary as it may seem, they are not united. There are three Stalinist movements, one of them on the verge of an open split with Stalinism (the Trotskyists have repeatedly offered the Stalinists to form a “Left Front” against the Moslem Brotherhood and the imperialists). A regrouping of the forces of the Left – one of the Stalinist groups detaching itself and collaborating with the Trotskyists – is not excluded for the near future. 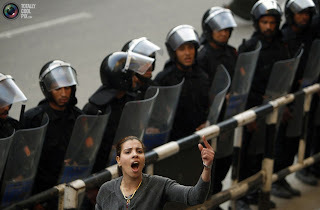 The task of the Left in Egypt is immense. Its cadres are still tiny. Even if the Left is too weak to guide the Egyptian workers to victory within the next few years, it is already strong enough to shake the actual instruments of the people’s servitude; religious prejudice and political ignorance. It is tragic that this clarity of vision from the left has failed so profoundly in the intervening years, with the cult of “national self-determination” and “anti-imperialism”, and more recently “anti-Zionism” taking its place. Of interest in relation to some of the above: the SWP’s Duncan Hallas on his experiences in Egypt after WWII. Via BfB: Egypt: Centre for Trade Union & Workers Services: The labour movement is in the heart and soul of the Egyptian revolution. Mohammed Ezzeldin on the roots of the revolutionary movement. Atef Said on Egypt’s long labour history. Juan Cole: Egypt’s class conflict. Stroppy: women of Egypt 1 & 2. Tom Streithorst: Hobbes vs Kropotkin on the streets of Cairo. Tunisia: Andrew Coates: why was Ben Ali’s party in the Socialist International?